Have you ever dreamed of being a marijuana strain reviewer? Or running your own cannabis magazine? At your fingertips are opportunities to obtain marijuana writing jobs to get your cannabis career off to a great start! Now, as much as ever, the cannabis industry needs writers to cogently advocate for decriminalization of THC and a fair legal business. As more reputable industry news sources like Denver Post’s offshoot The Cannabist appear, we’ll need good writers to represent cannabis and the rights we have as consumers. Like with cheeses and fine wines, connoisseurs know how something should taste. With weed in question, cannabis strain and product reviewers create succinct, descriptive critiques on the appearance, smell, taste, effects, benefits and drawbacks of a particular flower, concentrate or edible – you name it! The Denver Post famously hired the first “official” cannabis strain reviewer, along with launching ancillary site, The Cannabist. From then on, strain reviewers quickly became part of many niche and general online and print publications across the country. Especially in states where weed is legal, strain reviewers are looked to for guidance in deciding which sparkly bud to buy. Strain criticism jobs might sound like a funny, even superfluous job to some, but in actuality, these reviews are extremely helpful for those who use cannabis as medication. Reviews almost always detail how each product can spur specific health benefits and even reduce symptoms of chronic pain and nausea. Additionally, by adding cannabis to the same cultural realm as wine and coffee, it helps to destigmatize THC as a whole and give cannabis a more accurate and respectable reputation. As more varieties of cannabis have made their way onto the legal market, more reviewers are needed to cover the full spectrum of consumption methods and paraphernalia trending in the cannabusiness. If you want to work as a strain critic, but don’t feel like you have the experience to apply, consider starting a weed journal where you keep track of all the new strains and products you try. Take a toke or two, then make notes on the criteria listed above. once you feel confident separating out different terpene-fueled aromas, tastes and physical qualities, you can start compiling a portfolio. While I wouldn’t recommend doing too much work for free, it might help to submit one or two review trials to get your presence established. You get paid to smoke! But be warned, you can’t get too high and forget to record your data! Critics are expected to have refined palettes and insightful commentary, which can be hard to summon up in a couch-lock state. This is definitely one of the best marijuana jobs for introverts. Unfortunately, strain criticism is rarely a full time marijuana job. Writers are compensated competitively, but will probably have to work for any additional publication to gain a second income. Mary Jane themed magazines draw readers in with engaging images, social media presences and consistently updated cannabis content. To keep up with ever-changing regulations, people look to cannabis publications for reliable, up to date news coverage. High Times is a good example of a general weed magazine that encompasses lighthearted and funny content, as well as some harder-hitting journalism. Marijuana writing jobs as a magazine editor are a great way to express your creative voice through both writing and curation. Editors control the content that appears in the magazine, taking in consideration from the magazine owners and readers, alike. Editing a successful weed magazine is a high power job that requires long, late hours and meeting consistent deadlines. The work editors publish on high traffic websites is disseminated across the internet and sustains a big influence over a wide audience. Often, what’s great about editing a weed magazine is the opportunity to write about a number of separate, yet intersecting topics with cannabis like arts, music, entertainment and news. In fact, cannabis publications need writers who care about weed, and other things too! Having multiple interests will help to strengthen the presence of each section of the entire magazine. Perhaps the best part of being a magazine editor is the creative control it the job comes with. Being the editor of a successful magazine ensures you are a top level authority and tastemaker on your magazine’s subjects, in this case: cannabis. On the flip side, marijuana writing jobs of this sort can be stressful and require a lot of uncompensated hours being put into work. As a whole, marijuana writing jobs have increased in volume thanks to more websites cropping out, require content writers. The purpose of a content writer is to create texts, blogs and articles on relevant data, using Search Engine Optimization (SEO) keyword and linking practices to establish a strong web presence for the brand they’re representing. Content writing jobs can run the gamut from entry-level wage copywriting jobs to more advanced content editor and contributor positions. You can either work for a digital marketing agency such as Cultivate.buzz or provide your services as a freelancer. Most marijuana writing jobs are of the freelance variety, offering workers the chance to plan their own schedule. Web content writers sit at the cross section of marketing and reporting, attempting to produce thorough, researched content, while also asserting tactics for drawing customers onto a website and selling them on a product. Usually, working as a contact writer offers a level of freedom that most workers do not have over their schedule and workflow. 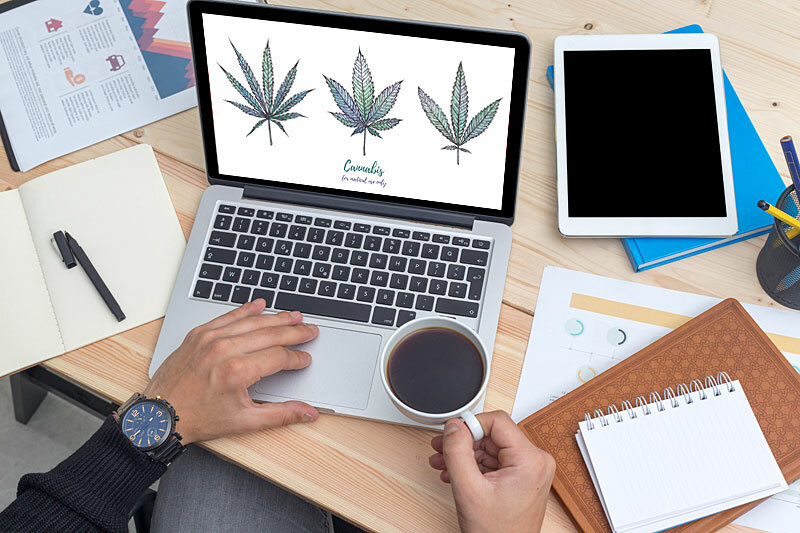 Working remotely and freelance allows content writers to work for multiple publications to create full time careers in cannabis-centric copywriting with these online marijuana jobs. The pay. Most content writers are paid by the word – entry level wages begin around $0.03 a word and rarely go much higher than $.10. Content editors and contributors for major publications however are exceptions to this rule and could make double these salaries or much more. Acquiring marijuana jobs isn’t always a simple task. Odds are you may have to send out a dozen or more inquiry emails and applications before hearing back, or being offered a position. When applying for an employee or freelance writing position, be sure to thoroughly review your application before submitting. A writer with a typo on their resume is likely not to be offered a position. In order to work as a writer, you don’t necessarily have to have a degree in writing, or anything for that matter. Employers are primarily concerned with the applicant’s portfolio, experience and ability to consistently communicate and meet deadlines. Do apply to a wide range of websites, businesses and publications. No great writer won every gig they applied for. Don’t get discouraged if you receive a rejection email or worse, don’t hear back at all. Simply send your portfolio off to another employer. Don’t work for free. Yes, a couple times is okay, but what working for free does to writers wages as a whole is not helpful and further reinforces the difficulties dedicated writers have finding jobs. Do meet deadlines. A sure fire way to lose your writing job is by turning in work that is consistently late or has clearly been written in a rush. Don’t obsess over the response. All writers should have a thick skin and know that reading comments on their articles, reviews, etc. is a fast and easy way to get discouraged. if you do want to hear feedback, consider only comments and critiques that are constructive. If there’s one trend we’ve seen in the marijuana job market, it’s just how interested people are in finding jobs across every sector of the cannabusiness. With entry level budtending jobs getting hundreds of applicants, and cultivators vying to sell their flower and concentrates in stores, it will prove interesting to see if the interested job pool remains in the years to come. Even when it comes to jobs that aren’t solely focused on writing, it is still important that the worker be a proficient writer. This is the case when it comes to scientific research, company outreach, dispensary correspondence, legislative drafting a more. Marijuana writing jobs are everywhere, they just have to be looked for. Ultimately, these freelance marijuana jobs are great opportunities to find success in this new industry.